TPP tissue culture products help prevent contamination! Problem: Tissue culture is a vital element of many research laboratories. Extensive experiments often stem off of cultured cells and provide valuable insight. Any break in the ability to use cultured cells or newly isolated primary cells impacts many experiments down the line. Growth of unwanted microbes and mold in tissue culture impairs the ability of a researcher to perform further experiments. The researcher must then use valuable time and resources to obtain new cells and avoid contamination in the future. Contamination in tissue culture is a complex and frustrating issue afflicting thousands of researchers every year. Contamination is not only costly, but results in great productivity loss. Solution: TPP, distributed in the United States by MIDSCI, addresses each contributing issue to contamination with its innovative and unique design. One of the biggest obstacles to overcoming and avoiding contamination is removing the optimal breeding grounds for microbes and mold spores. In order for microbes to grow, they need heat, a moist environment, and sustenance. Incubators provide the perfect breeding ground. TPP prevents the issues of condensation to build up between dishes, plates, and flasks while stacking. TPP dishes plates and flasks are manufactured with vented stacking feet (Figure 1). This not only decreases condensation by even air flow, but also evenly distributes temperature. Even temperature distribution among multiple samples and treatments is crucial in maintaining reproducibility. An additional contributor to microbe and mold growth is the location of the treated surfaces and “deck” seen in some flasks (Figure 2a). TPP has a flat growth surface directly up to the neck of the flask. In addition, only the bottom surface of the plates, dishes, and flasks are treated. When flasks are moved, media sloshes up onto the “angled deck” of some flasks providing an ideal breeding ground for microbes and mold. The “angled deck” or “dead space” provides yet another disadvantage: In order to add small amounts of liquid to the flask with a pipettor, the shaft must go into the neck of the flask to reach the media (Figure 2b). Introducing the shaft to the neck of the flask opens the flask for contamination. 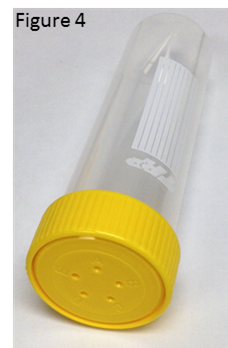 TPP flasks, with their lack of dead space, allow for only the sterile pipette tip to enter the flask for small liquid additions . TPP’s innovative design overcomes the obstacles the “angled deck” presents and prevents yet another contributor to contamination. The vented or filtered cap on a flask is meant to prevent contamination or allow for varying amounts of air to enter. The caps only provide a barrier to contamination when used and secured properly. Caps can be easily secured improperly, slightly skewed when turned on the neck of the flask. Improper cap securing can introduce microbes or mold spores to enter. The design of TPP filtered caps functionally avoids the issue. TPP filtered caps have a raised ridge area to help line up to ensure they are closed correctly. TPP vented caps have audible clicks to aid in proper ventilation and the securing of the cap (Figure 3). Suspension cells are just as easily affected by contamination as adherent cells. TPP manufactures a vessel for suspension cells that not only reduces contamination, but saves time and risk of contamination by eliminating the need to transfer to conical tubes before centrifuging . Gas exchange is often important in the growth of suspension cells and can also be a source of contamination. 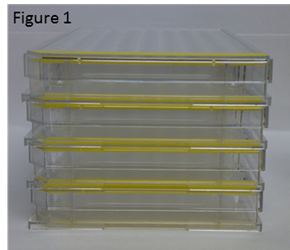 TPP bioreactors (Figure 4) have sterile gas exchange through the 0.22µm filter membrane. 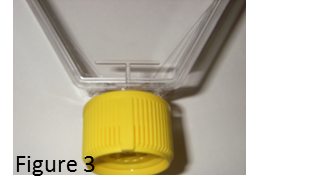 In addition, five openings of different size within the cap allow for varying levels of gas permeability, expanding the variety of experim ents that can be performed. The TPP bioreactor, available in 15, 50, and 600 mLs not only saves the researcher valuable time that would be lost due to contamination, but also time lost in transferring for centrifugation. It is essential that every researcher take extensive steps to ensure their cells and experiments are performed properly and without error. TPP products help prevent contamination and prevent the costly cleanup and productivity loss.